The global refugee crisis is now unprecedented in recorded history, with 1 out-of-every 113 human beings now forcibly displaced, and 34,000 joining their ranks every day.3 The majority of refugees are children.4 Governments simply cannot handle this unparalleled crisis alone. Some – including the US – are even rolling back their commitments. The force, reach, and innovation of the private sector is essential. 21 public companies in America have stood up, making significant contributions to refugee welfare, including hiring, funding, and in-kind services. They need public support to carry on and re-double their efforts, and to encourage other companies to follow their lead. We all know money talks. The loudest message of all is moving investment dollars, as corporations are fundamentally beholden to their shareholders. 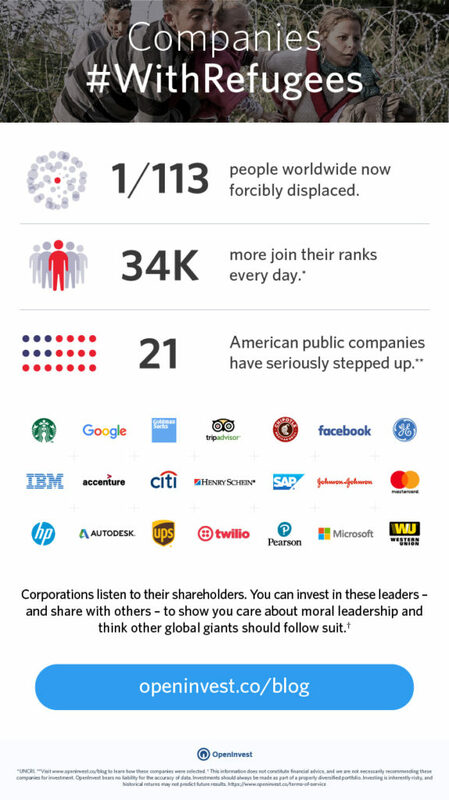 If the public invests in these leaders – and shares their actions with others – we send an unparalleled message to management that we care about moral leadership and believe other global giants should follow. For example, Starbucks has committed to hire 10,000 refugees over the next five years. Chipotle pro-actively recruits refugees through the IRC (International Rescue Committee). These applicants are more than 7x more likely to be qualified and hired than their traditional pool, demonstrating that supporting refugees can also mean good business. While some firms have focused on hiring, companies such as H&M , Goldman Sachs , Johnson & Johnson , and TripAdvisor , have pledged millions of dollars towards refugee aid. 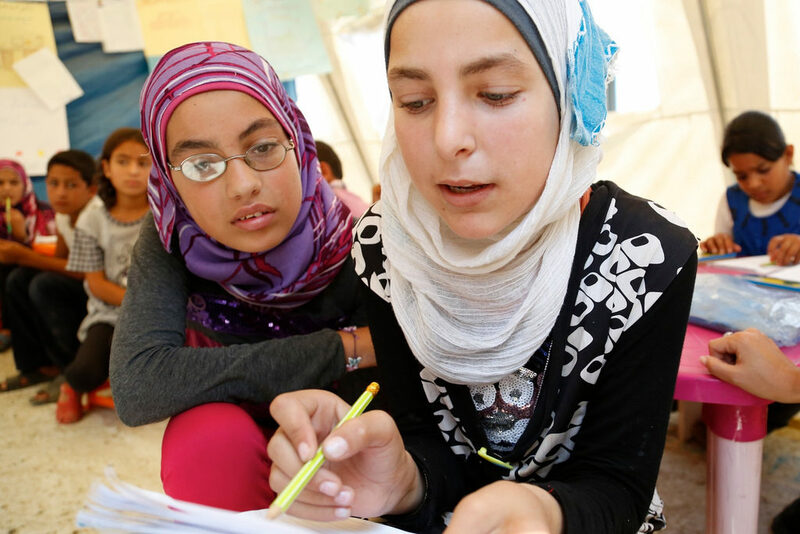 Facebook has been bringing internet connectivity to refugee camps, and Google is partnered with George and Amal Clooney to help educate thousands of refugee children in Lebanon. Public companies are by no means the only leaders. Private firms, from Chobani to AirBnB to Ikea, have been some of the most powerful and vocal advocates of refugee relief in the wake of the Syrian Conflict. Many small and local businesses across America have stepped up as well. Our friends at the USCRI, for example, told us of a local mattress company, from whom they’d ordered beds for the recently resettled, provided free sheets and blankets – a small but inspiring act for the front line staff. Finally, American individuals are also pitching in across the country. This recent Guardian article, for example, shows how a small town in Georgia has transformed itself, and countless refugee lives, by accepting over 1,500 refugees per year. We can have an outsized impact on them, as shareholders. When you own shares in a company, the CEO technically works for and reports to you. You’re in charge. In the meantime, these companies closely follow the sentiments and actions of their owners. Money talks, but shareholder money shouts. Thus, our investments are one of our most powerful tools to shape the world. Companies who share our values deserve our support. The most influential thing we can do is invest in these leaders, and share with others, sending a clear message to management that human rights is good business. As such, our portfolios can also benefit from tilting towards the companies with the vision, foresight, and values to help attract new sources of talent and forge a better world. Of course, investments should always be made as part of a well-diversified portfolio. Your investment portfolio should also naturally reflect your other values (e.g. fighting climate change, supporting equal rights, etc.) and not fund practices you loathe (see what’s hiding in your current portfolio). Talk to your investment manager to make sure your concerns are 100% reflected. Or, try OpenInvest, which is designed to make this all simple. With a couple clicks, we can incorporate the #WithRefugees Impact Investing Index into a low-cost, broadly diversified investment or retirement account. It’s easy, free to sign up, and we’re here to help! After all, both Sergei Brin and Albert Einstein were refugees. And Steve Jobs was the son of a Syrian refugee. Sound like a good investment? Share the list of Companies #WithRefugees with others! Support amazing aid organizations helping refugees. 1. 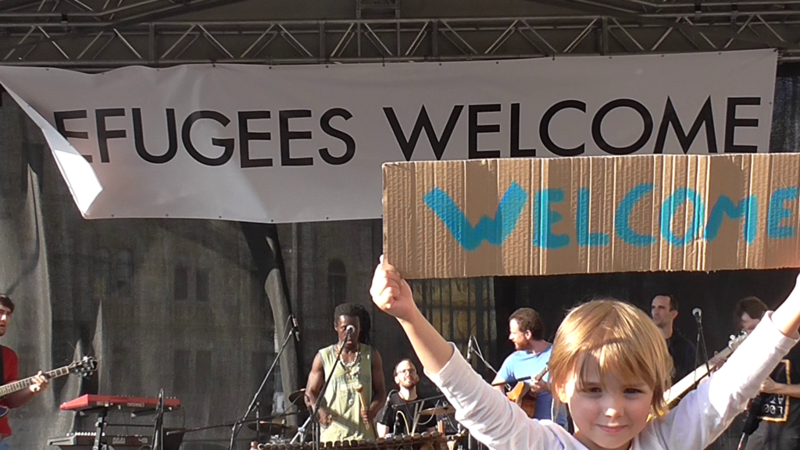 The #WithRefugees screen is based on extensive research, drawing on data from the Obama White House’s 2016 “Call to Action” commitments; mainstream media, foundation, and NGO reporting and public filings; company websites; and discussions with a number of leading refugee relief organizations (Refugee Council member agencies).The list excludes contributions made by foundations that are now fully independent from their corporate origins/namesake, and also Donor Advised Funds (DAFs) which serve as a legal vehicle for the contributions and charitable decisions of others. 2. Data transparency is often lacking or difficult to verify. Many companies, for example, do not provide updates on how they are executing against their commitments or do not publicize work they are doing. Moreover, the world is changing all the time. We made best efforts to collect accurate data, but we cannot guarantee accuracy. Individuals and organizations should conduct their own research before making decisions based on this data, financial or otherwise, and OpenInvest is not liable as such. We welcome input from others if we have missed any additions or amendments that should be made to this list.